Three massive quakes, a magnitude 7.5 - magnitude 6.6 and a magnitude 6.0 has rocked New Caledonia in the Coral Sea. New Caledonia and Vanuatu ordered coastal evacuations on Wednesday after the powerful undersea earthquakes triggered tsunami warnings in the South Pacific, but appeared to have suffered little damage. 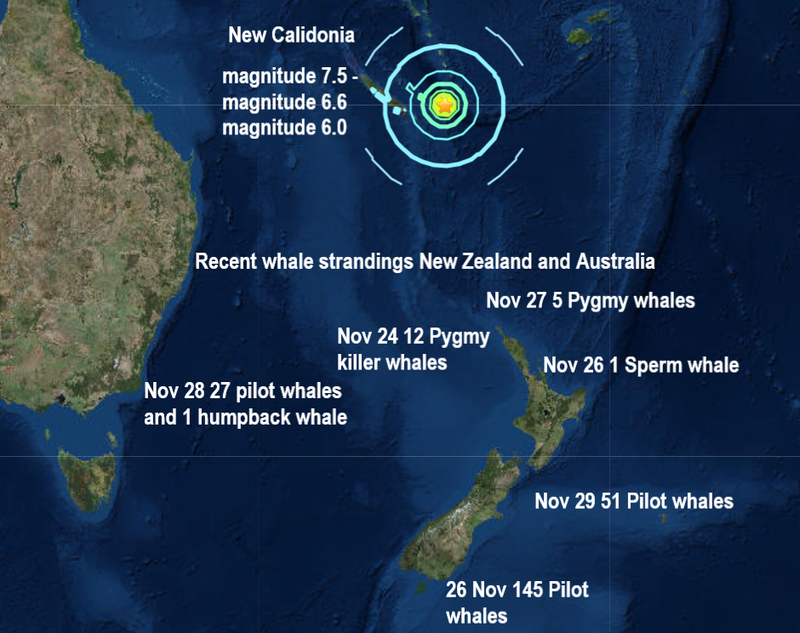 What could be significant here is the fact the quake area is close to where almost 250 whales died last week in six different strandings. Experts are at a loss as to why the whales have been washing up such large numbers recently. What has happened here could go a long way to understanding why whales and dolphins die in mass strandings. Incidentally, last nights 3 earthquakes bring the December total to 4 major quakes and 123 the total for 2018.